Gilbert Musonda is the Farm Foreman at Northrise Farms. He is also a student at Northrise University pursuing a degree in project management. Gilbert and his wife, Juliet, have three young children and have been living at Northrise Farms since 2012. Gilbert joined Northrise University in 2010 as the Farm Manager. At that time, he lived in a community called Twapia which is situated just opposite Northrise University’s Main Campus. 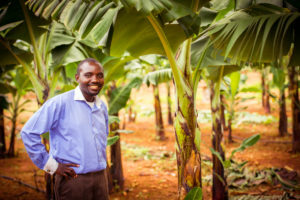 He managed the part- time workers at NU Farm and developed relationships with the women who purchase bananas at wholesale price and sell them at a profit to support their families. Most of these workers and customers live in Twapia which has a population of approximately 15,000 people. Together Gilbert and his friends from Twapia have been fighting together to lift the living standard there. It is out of their common bond of fighting for a better life that the people of Twapia approached Gilbert to represent them as their city councilor. At first Gilbert said no. But because of their persistence, Gilbert finally agreed to run for office in August 2016. He won! Gilbert will represent the farm workers and the families who live in his former community to help make things better in this community. Northrise and Gilbert have had a positive impact on the many workers and families in the community where Northrise University exists. Northrise is raising up leaders and changing the nation of Zambia…one student at a time. To God be the glory!